WELCOME TO THE BLOOD CLUB Light is a Rocker Blood Lifer with a talent for remembering things. He’s meant to be the predator. It’s been that way since Victorian times. But not now. Not since someone hunted him. Enslaved him. Ripped out his fangs. Who are these ruthless humans? Who’s their violent leader? And who betrayed the secret of the Blood Lifer world? You gave a tight smile. I leant against a column, as I had a gander back at the silhouette of the great house, its steep terrace, the wood encircling it beyond and the drive sweeping down to it, between the dark sentinels of oaks. In some screwed up world, this was the worst Jane Austen scene ever. I shrugged. After the year I’d had, this new twist to my existence had some dead stiff competition in the fried department. You ran your fingers nervously through your ash blonde hair, which hung in a bob to your shoulders. I had the sudden thought of how soft it’d feel on my lips…and then wanted to scrub my brains out. I haven’t long been alone - utterly, truly alone - since my first death. Since I lost the only person, who mattered to me in this brutish world, I feel too easily. Us Blood Lifers do that; every emotion is amplified. ‘I didn’t want…one of those broken things. Though you’ve gotta be soft making trouble for daddy. He’s the one, who’s insisting I buy one of you. He’s eager for me to learn about the business now I’m back. It’s not like I want…’ Embarrassed, you looked away. No tattoos – but one of my short stories is about tattoos: Tattoo My Name over Your Heart. I’m a traditionally published short story writer as well. My last book – Blood Dragons – was my debut novel. I performed the story at a reading once – it received just the reaction I’d hoped for. Freaked out in a… I get that way. Particularly from the women. Dark love. Or true, adult love – sometimes obsessive and unrequited. Painful. That I’ve been punched in the gut feeling? Can’t sleep. Eat. Feel like renting the world? But you’re alone in it. Because the world keeps on turning despite you. That’s Blood lifer love. The love at the heart of my new fantasy series Rebel Vampires. In the first book Blood Dragons, Light is caught between his century old love for a savage Elizabethan Blood Lifer and his forbidden human lover. It’s not like it was two months ago… Blood Dragons - my debut novel - was only released in August. Beaches, cocktails and sunbathing? Try a summer of books, computers and launches. Still, you don’t need to ask me which option I’d rather have. You do? OK – books, computers and launches win out every time! Well, I created my first book (including blurb and barcode) when I was four. I wrote my first full length novel when I was eight. The first fantasy novel when I was ten. Let’s just say I was keen. But professionally? When I was fourteen. My first short story was published by a magazine, who didn’t know I was a kid. Those were the days before the mighty search engine, where we could safely pretend to be someone else. See, rebel here? I didn’t really look back after that. Shall we skip the predictable stuff you’ve heard a thousand (million?) times before…like ‘read’? Know what makes you unique. Discover your voice – don’t mimic. Except do mimic everyone around you for dialogue. I was a playwright. And we as a breed love to listen to how people talk. Every time I hear a new accent I’m analyzing it: where do the pronouns go? What’s the grammar like? What’s the slang and rhythm? I love distinctive dialogue. And what I love even more? A distinctive voice in a writer. I don’t want to be reading just anyone – I want to be reading you. That’s one thing readers say about me – Rosemary A Johns sounds ‘unique’. I’d rather be an individual than one of the herd. That’s something to aim for. Blood Dragons – the first book in the new Rebel Vampires series – is about love. 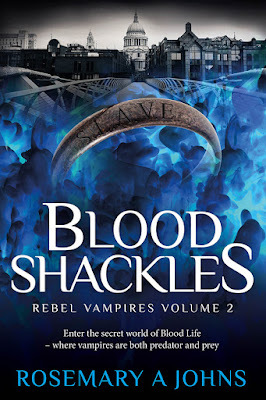 The fantasy series Rebel Vampires is set in the supernatural world of Blood Life, where vampires are both predator and prey. I love vampires. But I wanted to write a vampire book for adults. Where they were not simply the hunters but also the hunted. 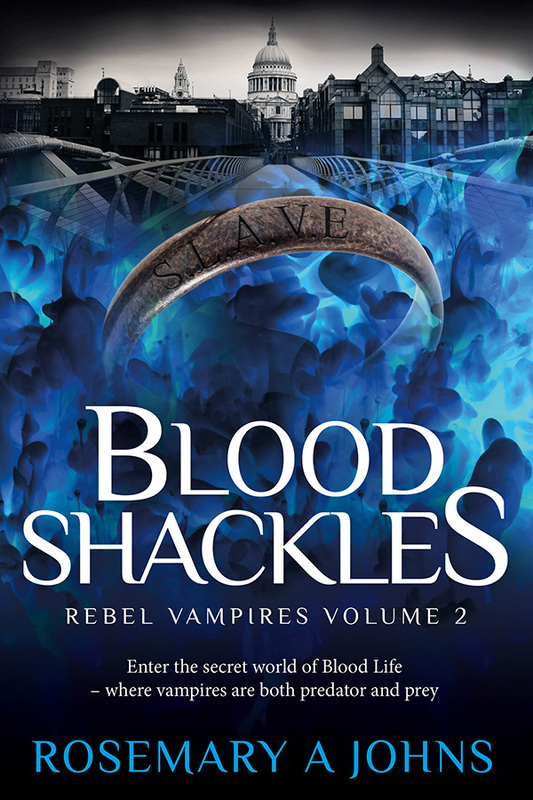 Vampires, rebels and romance in a hidden paranormal London. When I was writing Blood Shackles I knew it was going to be about family. It’s Taken. But with vampires. Light is on a redemptive journey. He’s enslaved. And yes – there’s love in Blood Shackles too. But there’s also something Light’s not experienced for 150 years – love of a family. And he experiences it in the most unlikely of places. It’s ultimately a book about hope. How love of family – and the drive to save them – can set you free. 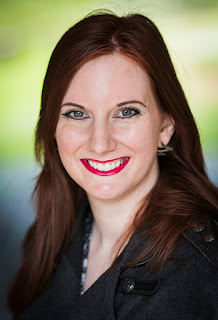 Hi Teresa - thanks for having me on your blog! Feel free to ask me anything you like - seriously, I'm not shy! Have a great day! Hi Nikolina - glad you enjoyed it and hope you have a great day! Do you prefer print or e-books? Hi Becky - great question! I love both but at different times... So I love print because I love the feel, the smell and the gorgeous covers. I also like seeing them on a shelf and being able to quite literally read them anywhere without fear. Like old friends! I love e-books because of the ease - I can buy in seconds and then escape there and then - with hundreds of books at my fingertips. Great invention! Hi Teresa! Something not many people know...here's a couple of things: I grew up in the grounds of an all-boys school, I studied the history of madness as a postgrad and I own a leather jacket. Just like Light. Thanks Rita - I hope you enjoy the series and have a great day! I really liked your use of language & humour in the excerpt. Hi Kate! Thanks - my Dad's a Londoner and Light's speech is a combination of 1960s London and Victorian. I love narrators with a sense of humour too. Enjoy the series and have a great day! Aha! That would explain why it resonates with me; even though we've lived in Ireland for years, we're originally from the UK. Thanks Victoria! Hope you have a great day! Thanks Victoria - hope you have a great day! Thanks Lisa -have a good day! Hi Teresa - hope you're having a good day! I love most the buzz - like coming alive - that happens in the first draft stage. There are a range of different stages - from research, plotting, and then numerous drafts and edits. But the first draft is similar to the rush I describe the Blood Lifers as experiencing when they blood share - like nothing on earth! I plan everything. Research, research, research. I know the ending before I write and plot like it's a screenplay. But after that? I let the characters free and it is like I'm watching a film in my head and just writing what I'm seeing down. Tarantino once said he saw his films like that. My favourite part changes day to day and in different moods! But there were particularly vivid scenes when I was writing - Light singing along to Amy Winehouse, whilst on his knees housecleaning or MMA fighting with the anarchist tiger of a punk. I don't want to spoil the scene that had the largest emotional impact for me though - and still makes me cry - but it's the one where Grayse saves Light by bringing him back to himself. It still makes me want to hold both of them! Hi Teresa - there are books waiting in the wings researched for the next series... I have to keep stopping myself from writing them! I hope it's helpful Trix - have a great day! Not gonna pick your brain today, just letting you know I shared. Thanks Teresa - hope everyone is having a great day! I like the fact that they're both the hunters and the hunted. Hi Kate - I wanted to twist the usual idea of vampires as the predator...in the series there's a thin line between both species - First and Blood (human and vampire). And which is truly the monster..? That's the question. Blood Lifers are safe when they're hidden in the shadows but when they're betrayed into the light, they become the hunted too. Hope you enjoy the series and have a lovely Thanksgiving! Hope everyone has a great Thanksgiving - and send me imaginary turkey and cranberry sauce because I'm here in the UK - wish I was over there with you! You're not alone Rosemary! I'm in Ireland so no Thanksgiving here either. Hi Kate - we both had an imaginary Thanksgiving then! Hope you have a great weekend! Cover Reveal Blitz "Silence the Northwoods"